Origin and Habitat: 120 km North West of Maltahöhe, Namibia. Habitat: They grow sunken in rocky environments and closely mimics the quartzite pebbles on which they grow and are lost to sight in this environment, this camouflage allows them to escape detection and is a very effective strategy for escaping predation. When they are found, it is usually due to their large and brightly coloured flowers. They are pollinated by bees, flies, wasps, gnats, bugs and other insects that are common in the area. 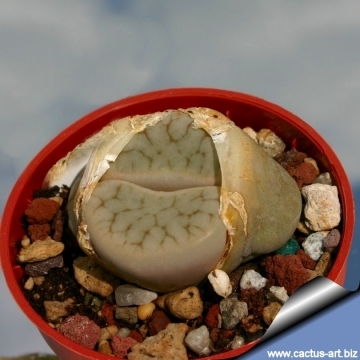 Description: Lithops pseudotruncatella subs. 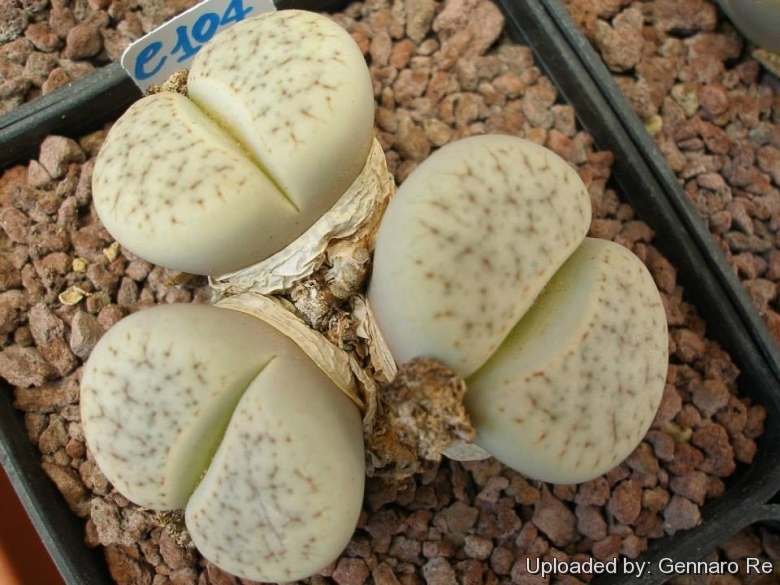 archerae is a distinct variety of the very variable Lithops pseudotruncatella. 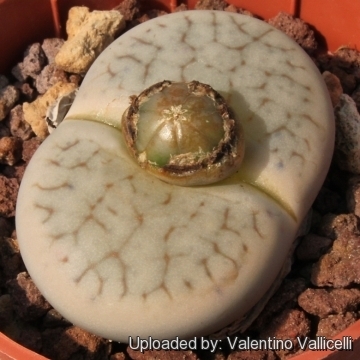 It is similar to the type, but easily recognized for its truncate profile and round-elliptic face, the uniform milky grey-green colour is also very characteristic of this plant. 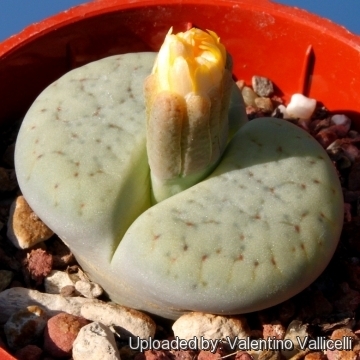 Habit: The plants are stemless, perennial succulents growing solitary or, usually, in clumps of 2-4 heads, but may occasionally form large clumps with more than 10 heads. Each heads consists of a single, simple, fleshy body which is split into two parts by a shallow fissure. 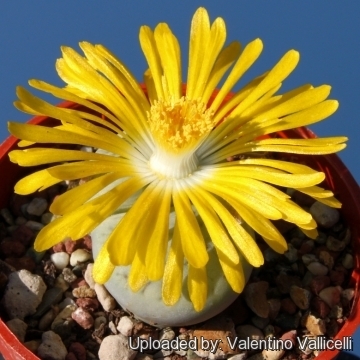 From this cleft a single yellow flower blooms when climatic conditions are favourable. A fresh pair of leaves grows every year almost as if a new plant emerges between the old ones. Body (paired leaves): The body is medium to large. Facial diameters 25-40 X 20-30 mm and up to 2 cm tall. Top of lobe flat to slightly concave (or sometime slightly convex) slightly rugulose (uneven). Faces round-elliptic. Sides grey light grey-green. Top of lobe varying opaque milky grey-green, sometimes bluish or yellowish. Windows numerous transluscent areas within indistinct light-coloured margins. Channels dark transluscent grey-green. Flowers: Yellow, medium to large, up to 40 mm in diameter, but usually less. Fruits: Seed capsules mostly 6-chambered. 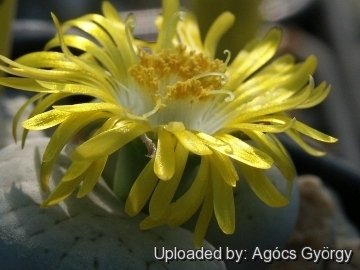 Seeds: Light yellow-brown to brown smooth to rugose.